« OfQuack: protecting the public from quack nutritional therapists? I’m not sure how I came across it, but it was probably on Twitter. 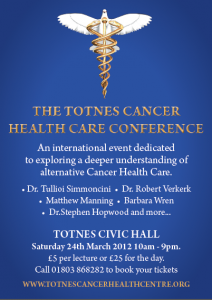 A conference on alternative cancer treatments is being held in Totnes in Devon this coming Saturday, organised by Dr Stephen Hopwood (cached) of the Totnes Cancer Health Centre (TCHC). Because of its content, I immediately complained to Consumer Direct (the central point for Trading Standards complaints) on 2 March who passed it on to Devon Trading Standards (TS). The conference is open to the general public and is titled: An Alternative View | Cancer Conference. “Dr.Tullio Simoncini – Italian Oncologist for 15 years and author of the book “Cancer is a Fungus” will speak about sodium bicarbonate as a treatment. Dr. Robert Verkerk – From the Alliance for natural health will discuss environmental causes of disease and cancer. Matthew Manning – Internationally renowned Psychic/spiritual Healer and Author, will speak about his vast experience as a healer and psychic. Barbara Wren – International Author, Principle of The College of Natural Nutrition. Barbara will speak on the core principles of health cultivation. Dr. Stephen Hopwood. 20 years experience as a Holistic Physician and Traditional Chinese Physician. Alan Papier. 30 years experience as a Chinese herbalist, Alan will discuss cancer from the TCM viewpoint using a power-point presentation in association with Giovanni Maciocia. John Hagger. A cancer survivor using “The Gerson Therapy” John will share his experiences and insights and lecture on the principles of Gerson therapy. Kevin Wright founder of ’Bobby’s Health Fund’ speaks about his sons natural cure and his commitment to educate and support the public about cancer health care. Dr Sarah Myhill will give an address to the conference on her perspective on treating cancer. The names of the speakers are linked to pages giving more details of their talks. I am concerned that this conference may breach the Cancer Act 1939 and could be highly dangerous and misleading to the general public. I am also concerned that some of the speakers may not be on the GMC’s List of Registered Medical Practitioners. I am also concerned about many other pages on this website (www.totnescancerhealthcentre.com) and request that you review all of them. Because this conference is only 3 weeks away, please treat this complaint as a matter of urgency. A few days later, Andy Lewis wrote an excellent blog post about it, highlighting the vulnerability of those seeking ‘miracle’ cancer cures: The Totnes Cancer Health Centre: A Quack Pascal’s Wager. I contacted Plymouth Skeptics in the Pub (SitP) and other skeptics in the area and they started to think about what could be done to help. Note that the programme will only be available until 27 March. I think it’s a little bit impolite. I’d suggest that if she was a little bit more committed to local businesses and a little bit more in tune with the spirit of Totnes which has built its reputation on complementary medicine, then she would have had the courtesy to come in and discuss with me who’s been running the Arcturus clinic in the centre of town for the last 15 years about the principles and practices of what we do here. Interviewer: She’s concerned about this word cure and whether the way in which you promote yourselves here at the clinic is kept within the Cancer Act 1939. Hopwood: I’m absolutely committed to working within those legislative boundaries and if you take the time to read our disclaimer on page 23 of the brochure or if you read our important notice that appears on the bottom of every single page of our website then you will see that we’re absolutely committed to working within those guidelines. Interviewer: Are you happy that that’s on page 23 of your brochure and at the bottom of your website as opposed to within the main body of the text? Hopwood: Em yes. It’s clear from everything that we say, time and time again, that we don’t aim to treat cancer; that is not our endeavour that is not our intention we don’t believe that that’s what we’re doing we’re not trying to do that. Interviewer: Are you treading a thin line? Interviewer: But this is a law — we’re talking about the Cancer Act of 1939. Hopwood: I’m obviously committed to staying inside the letter of the law because I continue to practise. Interviewer: You sound quite cynical about it though. Interviewer: Is that the kind of thing you want to see your MP Dr Sarah Woollaston doing opposed to going to Devon TS and reporting you for your advertising? Interviewer: But what about SW your MP? She’s a GP, after all. Interviewer: So she’s not coming into it cold, is she? She has a fair amount of knowledge. Hopwood: She has a fair amount of knowledge but she doesn’t have a great deal of knowledge about the principles and the practices of health cultivation. She has been a shop-front for the pharmaceutical industry, like most GPs, and that’s been the bread and butter of her work. And she hasn’t spent the time or put the energy into studying the details of complementary medicine so I invite her to actually come to the conference and meet the many doctors that we’re gonna have there and be in contact with the many doctors around the country and around the world that are now saying — as Prince Charles is — that holistic integrative complementary medicine needs to be integrated with our national health. I’ll leave you to judge Hopwood’s performance in this. I wonder if that was the day Devon Trading Standards contacted them? This afternoon, the story escalated and appeared on the BBC News website: Totnes cancer conference investigated by Trading Standards. 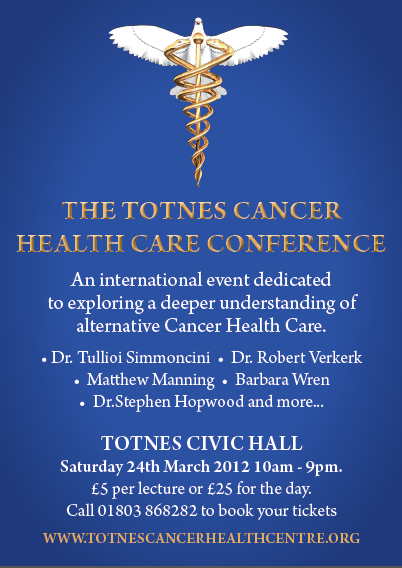 But the big news is that Totnes Radio station website has just announced: Totnes Council shuts Hopwood’s cancer conference down. THE TOTNES cancer conference, which would have heard from a disqualified Italian doctor who believes baking powder can cure cancer, has been shut down by Trading Standards and Totnes Town Council as it contravenes strict laws against advertising cures for the disease. The dramatic move, which was agreed by the Town Council this evening, follows a complaint about the Totnes Cancer Health Care Conference from Dr Sarah Wollaston, the MP for Totnes. I know of several others who complained after I complained to TS, but an MP’s voice is much louder than that of a few residents or someone from the other side of the country — I am just pleased that TS have done the right thing. Dr Wollaston said one particular issue was Dr Simoncini’s claim that cancer is a fungus that can be cured with sodium bicarbonate, otherwise known as baking soda. On his website, Dr Simoncini said he was struck-off as an oncologist, because he administrated sodium bicarbonate instead of conventional chemotherapy. Dr Wollaston said: “If he can provide any evidence base whatsoever that sodium bicarbonate will actually alleviate symptoms, then let’s see it, but I’m afraid nobody else in the conventional cancer community would actually share his view. It looks like Trading Standards did the right thing this time, but, unfortunately, Totnes Cancer Health Centre is by no means alone. 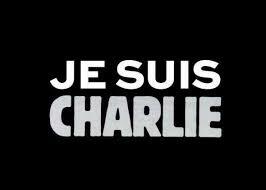 In my opinion, freedom of speech ends where someone can be physically harmed by such speech. I am extremely pro-free speech, but Cancer Act 1939 is necessary legislation. If anything, it should be updated to make punishment harsher. I am very pleased to read this news. This is great news! I think that we should bear in mind for future the impact that having an MP on side can have! No doubt there will be cries about free speech, but this is not about free speech: it’s about protecting potentially vulnerable people from unproven and disproven miracle cures. I am 100% behind this statement. Brilliant. Now what about a complaint about Hopwood to the GMC? Trading Standards have made them remove stuff from their website and they’ve told one of their speakers (the one who believes sodium bicarbonate can treat cancer) not to attend. Nothing to do with freedom of speech; all to do with protecting the public from dangerous and misleading health claims — that’s what Trading Standards and the law are for. Yes but dangerous and misleading claims should extend to implying that chemotherapy can cure cancer. Where exactly is the evidence for that? It destroys the immune system and the body’s ability to repair itself, so if you are lucky enough to survive in spite of receiving chemotherapy, it is very likely that the cancer will return since your body no longer has its natural defence mechanisms in place to prevent it. Same with radiotherapy. Radiation CAUSES cancer; it doesn’t cure it. The only conventional method that has any merit is an operation to remove a tumour, provided the whole tumour can be removed in one procedure. Removing just a part of it tends to cause metastasis. Actually, the majority of laws passed are made to protect corporate interest, not the public. This is about ‘miracle’ cancer cures being uncritically and potentially illegally promoted to the public. And please do some research about chemotherapy. Here’s something simple to get you started. Are they really? Citation needed. Having read that I still can’t see any concrete proof that those who survive do so BECAUSE of the treatment, and not in spite of it. The sad truth is many researchers will cherry pick studies and random bits of research that happen to back up their claim, so it often seems as though a drug is working when really it isn’t. I’m not saying the same isn’t occasionally true of complementary medicine too, but I’d rather take my chances with a few relatively harmless herbs and vitamins than with a shot of poison whose side effects include vision loss, early dementia, muscle wasting and death. On another note though, if cancer is not related to natural nutrition and lifestyle choices, how do you explain the dramatic surge in cancer cases in the last few decades, when it used to be an extremely rare disease that few people had ever even heard of? Since it has nothing to do with the subject of this blog post it is therefore off-topic, and I’ll leave it to you to do whatever further research you wish. Another way of saying you can’t think of an answer I guess. Oh well, it was worth a shot. I suppose I’ll never convince you that alternative treatments work; and years of extensive research and a fully functional brain mean I’ll never believe the crackpot chemotherapy pushers either, so we’ll just have to agree to differ. No. It’s a way of saying I’m not here to do your research for you. There is no name on it. Some one is trying to make Steven look bad but not willing to put his own reputation on the line. If you want to contact me leave your email address here and I will be in touch. Nice blog, Fishy. Thanks for the link.